The above examples here have been machined to suit both Mk22 Godfrey Marshall Cabin Blowers as well as the J50, J75, J100 and J150 series Marshalls. Covers comprise a lightweight casting, are 3/16 inch thickness, are machined to accommodate a lip seal and are all double vacuum impregnated. The Marshall A75 gear cover is an in-house designed pattern whereby an original A75/Mk 10 (X) gear cover was studied which was rather generous in it's wall thickness. 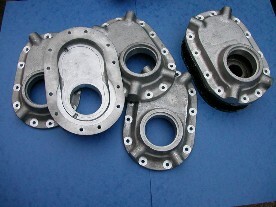 Therefore, the design has been improved for MMM use and the weight of the casting has been reduced by approximately 1/2 Kg. For the drive outlet section of the casting, a recess can be machined to fit an oil seal to work with the coupling. We will machine this recess to accommodate a 2 1/4 inch OD lip seal fitting unless advised otherwise. The bosses have been incorporated at the 12, 1, 6 and 8 o'clock positions. The cover incorporates 'Marshall A75' and has been cast in LM6. We also manufacture our own supercharger drive shaft coupling sets. 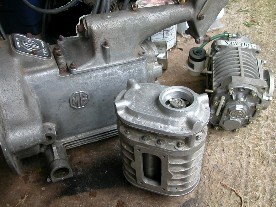 Supercharger cover castings for the Mk 21, Mk22 and Marshall J Series blowers incorporate a boss at each corner position. We generally machine a top and bottom corner position on each casting to accommodate a 1/4 BSP plug for filling and draining. Some customers wish to have the additional two corner positions similarly machined for adding a manometer or feed/return to an oil reservoir tank. VMGP can undertake the additional machining for an additional £9 per position. The A75 supercharger cover is supplied with a single top and bottom filler/drain plug although can be supplied with an additional filler level drain plug on the axle midpoint boss as shown in the photograph above. 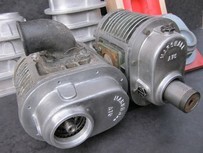 The additional machining cost is £9.